ESO Supernova Exhibition — How is ESO run? A bit like a country may have a prime minister controlled by a parliament, ESO is led by the Director General, who is appointed and controlled by the ESO Council - the main governing body. Good old days: ESO historian Claus Madsen (left) interviews Adriaan Blaauw, ESO’s second Director General. 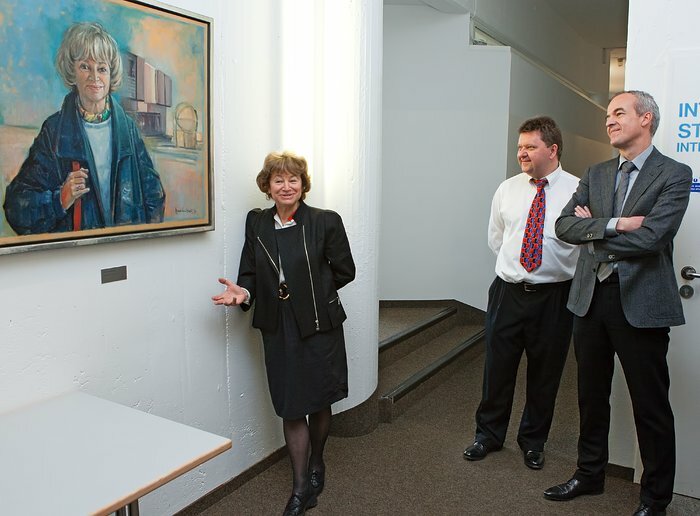 Piece of art: Catherine Cesarsky, ESO’s sixth Director General, at the unveiling ceremony of her portrait in 2011. A big organisation needs strong governing. ESO's Director General is appointed by the ESO Council, which includes representatives from all Member States. Five Directorates provide services in Administration, Engineering, Operations, Programmes and Science. The Council, advised by the Finance Committee and the Science and Technology Committee, oversees all decisions taken by the Director General and the management team. Green light: Members of the ESO Council look happy after approving plans for the construction of the E-ELT, in December 2014. ESO’s top boss is the Director General — there have already been several. They works together with five other directors, and their decisions are controlled by the ESO Council, which acts like a government.